We have seen in Table 2-2 that humans are presently contributing a large amount of particulate matter, and, certainly, aerosols, to the atmosphere. If this material, like that emitted by volcanoes, can contribute to a cooling of the earth, presumably by increasing the earth's albedo, then this may partially mitigate the effects from the simultaneous C02 emissions by humans. We have definitely been increasing both the carbon dioxide and the particle and aerosol content of the atmosphere, and these changes must have some influence on the greenhouse effect and the albedo, which have a further effect on climate. Human efforts are superimposed on natural trends such as the orbital variations considered in the Milankovitch theory, but it is not clear at present whether human changes or natural effects have the greater magnitude. Furthermore, the earth's climate is determined by a complex set of positive and negative feedback systems that no one, at present, understands completely. 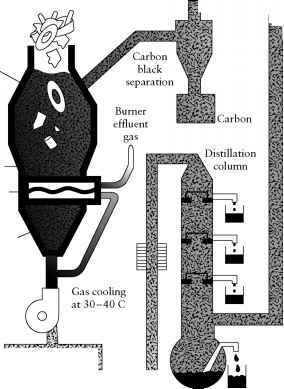 As an example of a negative feedback (or self-limiting) possibility, suppose that an increase in C02 content of the atmosphere caused an increase in temperature because of an increased greenhouse effect, which then caused an increase in evaporation of water from the oceans to form more cloud cover, which then reflected more of the sun's radiation to lower the temperature back toward its original value. It is an interesting exercise to dream up these self-limiting processes. The earth-atmosphere-ocean system is so complex that it is easy to imagine such self-limiting or even oscillating processes, but very difficult to develop models that produce results in which one has confidence. A positive feedback possibility involves the idea of a slightly colder than usual winter with extra snow cover at high latitudes as postulated in the calculations made for Figure 3-12. This would increase the earth's albedo, allowing less of the solar radiation to heat the earth and its atmosphere than before; the extra snow would not melt completely. This would cause an even colder winter (because of the extra snow cover in the fall) in the following year, and so on. Good climate models need to invoke both negative and positive feedback systems. 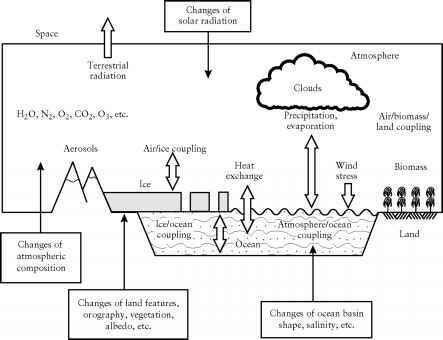 FIGURE 3-16 Schematic illustration of the components of the earth's climate system, together with some physical processes responsible for climate change. Redrawn from M. C. MacCracken, A. D. Hecht, M. I. Budyko, and Y. A. Izrael. eds., Prospects for Future Climate. Lewis Publishers, Chelsea, MI. Copyright © 1990. Used with permission. of temperature for the earth's surface and atmosphere (again, as a whole), and some involve the general circulation of the atmosphere and the oceans, allowing for the calculation of the geographical distribution of temperature, precipitation, and other climate quantities. These models are constantly being refined and checked against each other and against past climates of the earth. For example, a model developed at the National Center for Atmospheric Research (NCAR) in Boulder, Clorado, has given an excellent simulation of the present climate by incorporating the effects of ocean eddies hundreds of kilometers in diameter. This model has been used to predict a global warming from the increasing CO2 concentration in the atmosphere that is smaller than the amount anticipated by earlier models. Further comments are beyond the scope of this book.